In this classic locked room murder mystery, “The solution of the problem baffled everybody who tried to find it.” Indeed, it is an excellent example of this mystery troupe. Surely, there must be a secret passage, some means by which the would-be killer escapes, but no, it is explicitly stated that there is no egress. The murderer must be in the room, but the fiend is not found inside! What an excellent puzzle! Mathilde Stangerson is not killed in the attack, but she’s rendered insensible for some time. Later, it appears as if she knew her killer and strangely conceals information that would lead to an arrest. Why? Map and details about the circumstances of the Yellow Room. As if the circumstances of the Yellow Room were not enough, there are two more attacks on Mademoiselle Stangerson which are equally mysterious in that the assailant vanishes each time. One might almost think this is author Gaston Leroux’s reaction to Edgar Allen Poe’s famous, The Murders in the Rue Morgue, another locked room mystery. In fact, that very story of Poe’s is referenced in Chapter Seven, and—horror!—the solution to it given so casually! 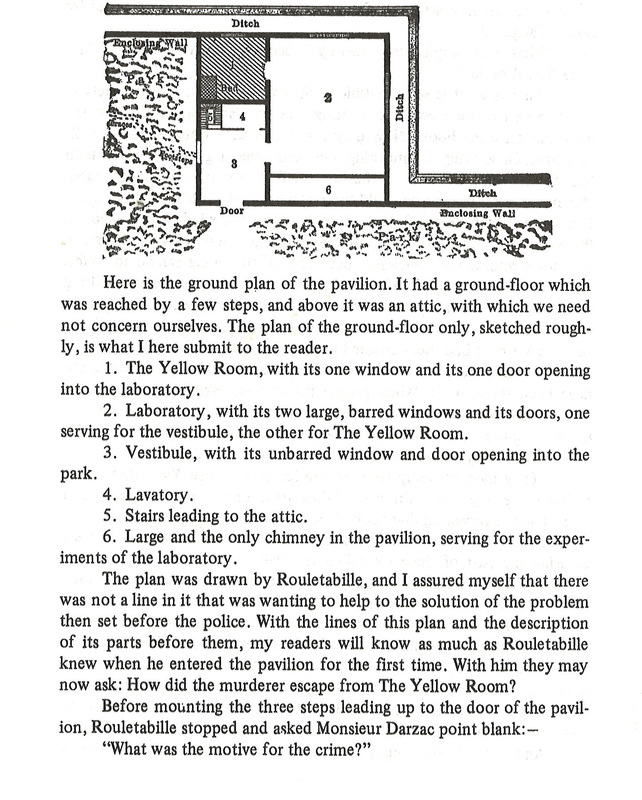 Ironically, the ending of The Mystery of the Yellow Room is revealed all to frequently in searching for details about in online searches, including in Wikipedia’s entry on the novel. Part of this stems, I’m sure, from the status of the story as a classic of the genre and inspiration for other authors, including Agatha Christie. Fortunately, I did not know the solution in advance and was completely riveted by the end of Chapter One to this clever puzzle plot. Though I suspect even readers who know the outcome would find interest in seeing the pieces brought together. And the pieces are plentiful! Clues abound whether they relate to the main mystery or subplots related to it. Rouletabille misses nothing. Examples: “The presbytery has lost nothing of its charm, nor the garden its brightness.” “We shall have to eat red meat — now!” These curious phrases are spoken by the reporter, and their meanings are important. Yet Rouletabille is not the only detective at the scene of the crime. Famed detective Frédéric Larsan is called in by the Sûreté to investigate. His conclusions differ from Rouletabille, and he afixes guilt on Mademoiselle Stangerson’s fiance, Monsieur Robert Drazac, who is conveniently not around when she is attacked. Rouletabille is convinced the famed detective is on the wrong path. In order to match wits with Larsan and Rouletabille, we readers must rely on our narrator, Jean Sanclair, a French magistrate, who serves as Watson to Rouletabille’s Holmes. “… there cannot be any author’s vanity in all this, since I do nothing more than transcribe facts on which an exceptional documentation enables me to throw a new light …” So Sanclair tells us in his narration of the events which we are told occurred fifteen years prior. Sanclair, like Watson, presents the case plainly though he, like us, is perplexed by these seemingly inexplicable events while Rouletabille possesses an almost preternatural knowledge of the whole. The Mystery of the Yellow Room is a must-read for any reader or writer of mysteries. Knowing the conventions of the genre will not necessarily help you solve it. Knowing the solution or reading it for the second time will yield insight into the crafting of a complex mystery. If there’s any weakness, it would be in the need for some suspension of belief in regards to some characters’ actions.